Paul Weller Interview With The Bournemouth Daily Echo! – Paul Weller News! Paul Weller Interview With The Bournemouth Daily Echo! 2 Comments on Paul Weller Interview With The Bournemouth Daily Echo! Paul Weller talks about being at the cutting edge of British music. WE live in funny times. Of course it’s only right and proper for the young to hold dominion over pop music, but what happens when some of the most challenging, affecting and downright edgy music of the moment is being made by people in their 50s? Paul Weller has been a fixture on our musical landscape since the late-1970s, first with The Jam, then the much maligned Style Council and, since 1990, as a solo artist. He’s never shied from his influences – The Beatles, Small Faces, vintage soul and funk; he even turned in an album of house music in 1989. It cost him his record deal. In the mid-1990s he was labelled The Modfather, the godfather of Britpop, but by the end of the decade he was being unfairly dismissed as a leading light of ultra-conservative Dad Rock and ushered out into the wilderness by the blinkered taste makers. More fool them. He turned 50 in 2008 and released the double album 22 Dreams which found him re-igniting his muse as he delved into kraut rock, avant pop, Northern Soul, folk, eastern raga, free form jazz and anything else that took his fancy. A creative peak, it reaffirmed Weller’s rightful place at the cutting edge of British popular music. If anything, this year’s follow up, the sinewy Wake Up the Nation, pushes the new possibilities even further, condensing the musical vision into one of the leanest records of his whole career. Almost universally praised, and nominated for the Barclaycard Mercury Prize, I wonder if he’s tired yet of hearing other people saying how good it is. “Listen mate, I’m never ever tired of hearing people praise my record!” he laughs, his voice an unmistakable 20-a-day rasp. “I guess the process started with 22 Dreams which was made in the spirit of indulgence really. I thought:‘I’m going to be 50 soon, I’m going to go really flat out to try as many different things and purposely make a very indulgent record’. And Wake Up the Nation was the result? “Well, yeah. We were trying to make a record of the music we weren’t hearing, that was kind of like a bit of brief.We just wanted to make something that was going to get people sitting up and listening again and getting excited by music again – break down that corporate safety-seeking that permeates music. So, any evidence yet of any young bands heeding the call? 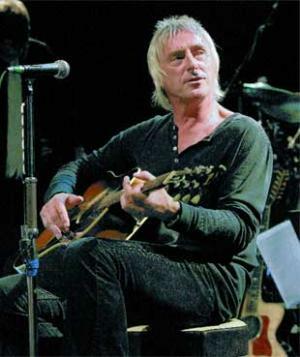 Weller has picked up a reputation for prickliness, but looking back it seems he has attracted as much criticism for mellowing. Truth is, he can’t win. He’s been an easy target in the past, but the sheer quality of his recent work means he’s much more difficult to hit nowadays. “You always associate pop music with youth which is fair enough, it was always the property of youth. But you’ve got people my age that have grown up with it and we ain’t gonna stop now. You’ve got people again ten years older who grew up in the 60s and same thing for them, it doesn’t stop for them. They were brought up on rock ’n’ roll and it’s become their culture and part of their lives. It sounds like the 52-year-old Weller is having the time of his life. Age is clearly no barrier to anything – he’s even rekindled his friendship with former Jam bassist Bruce Foxton, the two playing together for the first time in 28 years. Getting older is alright then? “Well, I can’t do much about it really! You just have to go with it. I mean I still can’t believe it myself. I talk about events that happened 30 years ago, 25 years ago and it just seems like five years ago to me. I just can’t believe how quick time goes. I guess maybe there’s also another spur in making me want to work and develop and move forward – it’s, without being too morbid, just how short life really is. I just think I want to do as much work as I possibly can really. There’s a soulfulness about Weller’s conversation that isn’t always apparent in interviews. It’s pointless looking for meaning, but I ask him if the death of his father (and for much of his career, also his manager) John last year has had an impact on the music he’s making. “I guess so, I couldn’t say otherwise, maybe on some subconscious level, I don’t know. It didn’t make me want to make an album of gloomy, doomy songs, quite the opposite really. And pass it on to your own kids presumably? “Me dad was a beautiful fella, but one of the greatest things for me was that we were friends as well. There’s not much more you can ask really but to be friends with your children, which I think I am with my kids. Well, I know I am. That’s what he passed on to me. I was very, very fortunate as well that I had that relationship with my dad. And it’s clearly important for Weller to get on with the people he’s close to – he’s fiercely loyal to the musicians he surrounds himself with, but never afraid to shake things up when the time is right. He split up The Jam in 1982 when every single they released went straight to number one; and only two years ago he parted company with Steve White, his drummer of choice for the previous 25 years. But the decision is vindicated every time the new band takes to the stage. • Paul Weller headlines Summer Madness at Carisbrooke Castle, Isle of Wight on August 29, www.iowsummermadness.com; and plays the BIC on November 28. Previous Entry Classic Article – "Paul Weller’s 12 MUST HAVE albums!" Next Entry Paul Weller’s "Fast Car / Slow Traffic" Numbered White Vinyl Pre-Order!